Two players, read partner and react to shoot or drive. 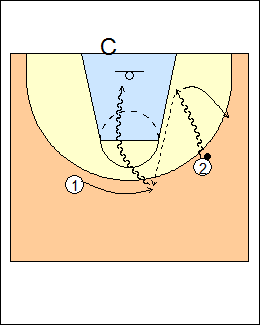 Each player takes 3 shots from 5 spots (corner, wing, top of the key, wing, corner), one player take 3 shots from a corner, switches with the rebounder, then they move to the next spot. 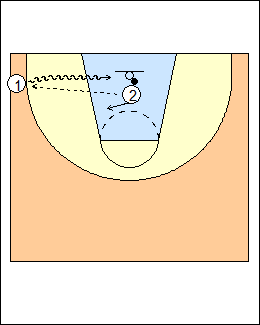 Rebounder 2 passes to shooter 1 then either puts his hands behind his back, which triggers a shot by 1, or puts his hands up overhead, which triggers a drive by 1. Here 2 puts his hands up, 1 drives. 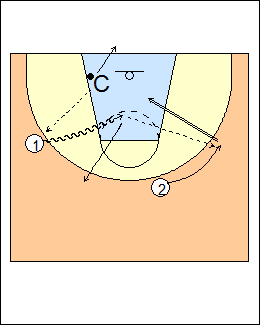 2 can follow his pass to close out. 1 goes back for a pass, this time 2's hands are behind his back and 1 shoots. Continue until each player has taken 15 total shots. 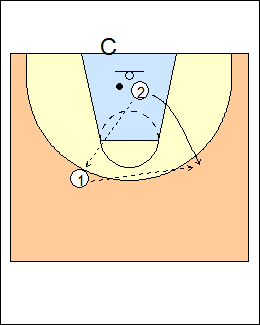 See YouTube video - Partner decision shooting warmup. Also see Dribbling - Chair drill, Shooting - Pasquali reaction, Drive-and-kick. Coach passes to 1, who drives and kicks to 2, then puts his hands up and 2 drives, or puts his hands behind his back and 2 shoots (shown). Leonzo's rule of thumb is that the ball pushes you away if driven toward you (shown); if dribbled away from you, fill behind. Coach gets off the floor. - rotate behind a drive towards you (Euro cut). 2 rebounds, passes to 1 and exits for a return pass. Now 2 drives and kicks to 1, who reads the drive and whether 2 puts his hands behind his back (1 shoots) or overhead (1 drives, shown). 1 rebounds, will pass to 2, get a return pass, continue. 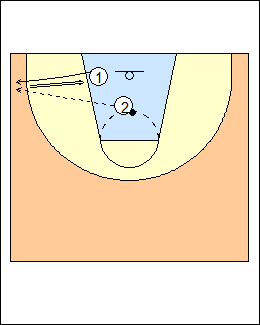 See YouTube video - Dribble reaction shooting.